The VALS survey integrates into Strategic Business Insights' biennial MacroMonitor, a macroeconomic survey of US households. To learn more about households paying off student-loan debt, contact us today. In 2012–13 the MacroMonitor reported that 11.5% of US households were paying off an education loan; in 2014–15, the number rose slightly to 12%. An April 2016 College Board study finds that two-thirds of college graduates have student-loan debt. Although a college education no longer guarantees employment, a graduate will experience, on average, lower unemployment and higher wages during his or her lifetime than did college graduates a decade ago. Graduating is the key. The 2 June 2016 New York Times reports only 55% of students attending "private, nonprofit colleges graduate within six years"; the graduation rate for students attending public colleges is only 46%. Some college dropouts have a student loan but not the ability to repay. In 2013, the Department of Education reported that one in ten recent borrowers defaulted on a student loan in the first two years—the highest default rate since 1995 (the default rate includes loans to attend for-profit colleges). Homeowners, corporations, and even countries may file for bankruptcy, but student-loan borrowers may not. The MacroMonitor finds that of the 14% of households that are currently paying off student-loan debt, 44% have a private loan, in comparison with 82% that have a government education loan—4 million households have both. Beginning in summer 2016, the federal interest rate for undergraduate-student loans for the upcoming academic year (3.76%) will be lower than it was a decade ago (6%), declining from 4.29% a year ago. Lower interest rates will help new borrowers. Penalties for people who default remain onerous: Employers may garnish wages, the government can withhold income-tax refunds, and lenders can sue borrowers to collect loans. Innovators, Achievers, and Experiencers (in rank order) are the most likely households to be paying off student loans; together the three groups represent 52% of student-loan households. The majority of US citizens with student-loan debt who say that "college wasn't worth the cost" (45%) are members of low-resource groups—more than one-third didn't graduate, more than two-thirds have trouble making loan payments, and more than three-quarters earn $50K or less a year according to Consumer Reports . Even for households with gainfully employed household heads, the burden of student-loan debt continues to inhibit Millennials' desire and ability to buy homes, vehicles, and other necessary products as households form and Millennials establish families. 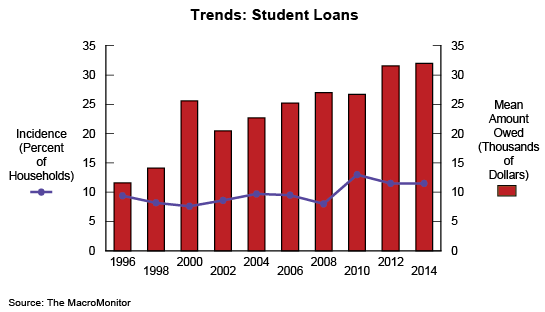 Millennials are not the only households affected by student-loan debt. More than one-quarter of households paying student loans have heads age 50 and older—an age at which households traditionally focus on saving for retirement. Ironically, borrowing in order to secure a better-paying job to afford the better things in life may burden a household to the extent that it may delay household formation, development, and even retirement. To learn more about the VALS groups with student-loan debt, contact us.